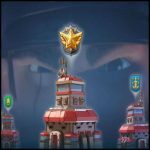 All about the Tribes | Boom Beach. All about the Game! 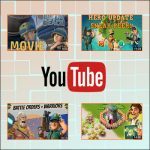 ← A selection of great and interesting Boom Beach videos! 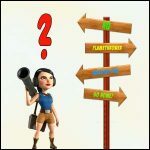 What are Tribes in Boom Beach? Tribes – the event that was introduced into the Game with the last update. The essence of this innovation is that the whole archipelago map divided into six parts (territories), each of which belongs to different native tribe (or is a separate tribe, if to say in other words). Important! Tribes are not active and can’t help us until we fully explored their territory on the archipelago map. At what level are the Tribes unlocks? In order to unlock the Tribes in Boom Beach we need to explore all their territory on the archipelago map (or territory of the one tribe at least). In other words, we need to explore all archipelago map, and this we can do only with the Radar of 20 level. Thus, to unlock the Tribe event we need to reach at least 50 level of experience (on this level unlocks an ability to upgrade HQ to the 20th level). What benefits we get from the Tribes? Tribal Boost. This is an analogue of Statue. In other words, the principle of Tribal Boost action is the same as statues acts but with narrower direction and limited period (Tribal Boost resets each 2 weeks). For example, red TH statue increases health of every type of troops, while Tribal Boost increases Tanks health only (or some other unit). Every tribe has different skills, which corresponds to different types of statues. Spiritdancer Tribe – increasing chances to get Power Stone, GBE increasing, etc. (an analogue of purple statues). Iceguard Tribe – increasing of defensive buildings damage (an analogue of ice statues). Frostbanner Tribe – increasing of buildings health (an analogue of ice statues). Firespike Tribe – increasing of troops damage (an analogue of red statues). 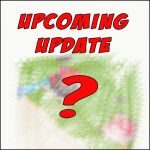 Emberfury Tribe – increasing of troops health (an analogue of red statues). Lifewell Tribe – increasing of resources production, resource rewards, etc. (an analogue of purple and green statues). Tribal Militia. With the help of tribal militia, we can quickly destroy NpC bases. Thus, near the buttons “Explore” and “Attack” appeared the third button “Destroy”. If to press this button the NpC base would be instantly destroy by aborigines (there are no physical attack and we can’t watch it… the destruction of NpC base by tribal militia looks like just map clearing and no more). In case of using Tribal Militia, we get a resources and VP, but amount of resources is lower than if we destroy the base by ourselves. Another important thing is we cannot get Intel using Tribal Militia. How to activate Tribal Boost? To have an opportunity to use the Tribal Boost ability we need to provide the tribes with Raw Crystals. This is new type of currency in the Game that applies only for tribes. 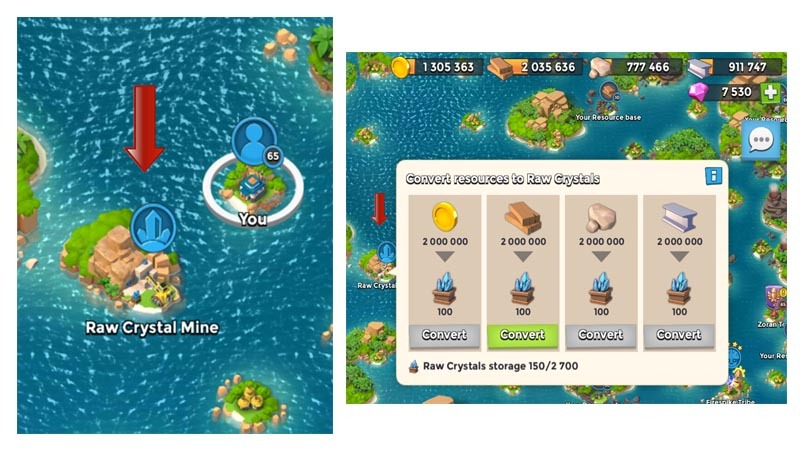 To get these crystals we can from the Raw Crystals Mine that appears near our island after map explored and tribes unlocked. Using this Mine, we can exchange our common resources (wood, gold, stone, and iron) for the Raw Crystals. Thus, there is an additional incentive to attack more and gather more resources. 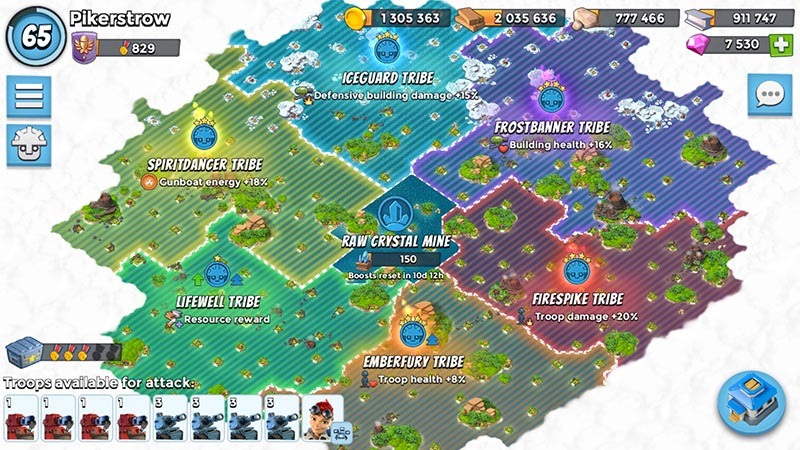 Tribes has own levels (five) and can be upgraded. 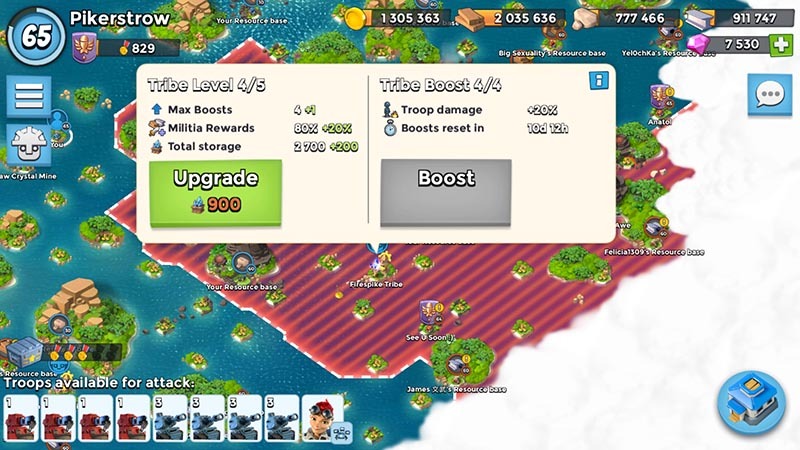 The higher is level – the higher are bonuses (reward from Tribal Militia using and Tribal Boost boosting). Upgrade tribes we can only for the Raw Crystals. Hope this brief review helped you deal with the tribes and made everything more clearly! This entry was posted in ATTACK, DEFENSE, OTHER and tagged Attacks. Bookmark the permalink. Maybe some glitch… write to support team. Hello , what I don’t understand is when tribes give shock launcher health boosts and so on. Since our owned resource bases don’t have shock launchers or prototype weapons, how would it help since SL and PTW’s are Home base only ? 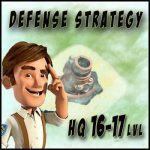 I understand boosts that help defend resource bases like MG , Cannons and so on , just not the above mentioned. Thank you ! I’ve unlocked 2 tribes but the destroy button doesn’t appear. Am I missing something? Hi! Would you show a screenshot from the Game with this bug?